Loved your blog on the volcanoes! This has always been a source of preplexity to me and you just explained it perfectly. I couldn’t agree more … enough with the plastic flowers already! Why, oh why do they even make them? I have no idea. I’ve even seen silk flowers in the landscape — the tattered threads give them away. OK, can I add one more? Leaf blowers. Gas powered leaf blowers whose piercing roar and whine ruin the peace of weekend afternoons because some people think that EVERY SINGLE LEAF should be blown out of their beds and out of their grass so nothing gets in the way of the Weed’n’Feed. I mean, power lawn mowers are bad enough (I have a push mower), but leaf blowers don’t even work all that well. I want to yell at some of my neighbors, “JUST LET THE LEAVES ALONE, DAMN IT! And if you have to get rid of leaves somewhere, PICK UP A RAKE, IT WON’T KILL YOU!” Not that I get all that worked up about it. Jason, you can add as many peeves as you’d like. For years, I swept and raked my yard debris, only to have the neighbors’ lawn care service guys blow their debris to my side. I surrendered and blow right back. Welcome to suburbia. Not just suburbia! I live just outside a town of about 2,500 and, although I can’t see my neighbors’ houses, I can HEAR their #! @*able leaf-blowers, weed-eaters, lawn mowers, chainsaws, wood chippers, combines, hay-balers plows and whatall. To add insult to injury, one neighbor has a son with a car stereo system that would shame the equippers of a large concert hall. But, ah! Early morning is a joy of birdsong accompanied by a light breeze rustling the leaves and after dusk we are treated to a chorus of crickets and frogs with a light show by the fireflies. Hi Ann. I was about to go on a rant about car stereos, but your second paragraph calmed me. Beautiful image! Great post! Makes me proud of my very real but not quite tidy flower and vegetable beds…Thanks! Fake flowers are a tragedy in a yard. 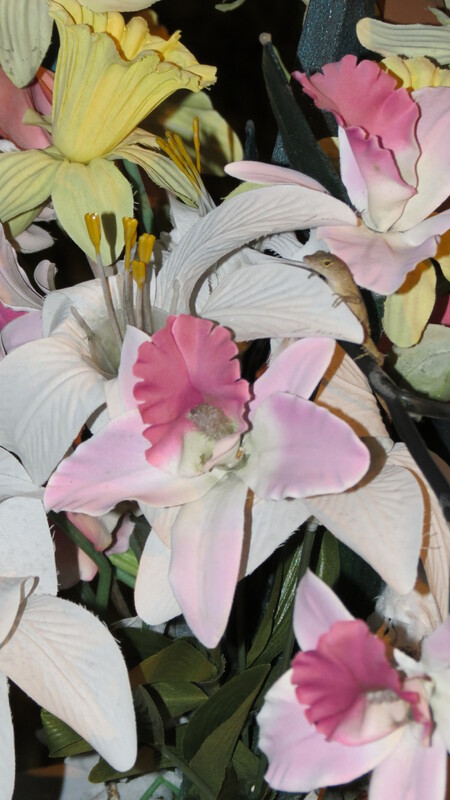 The color of those plastic flowers are always just…wrong. Hi Char. I cannot tell you how many times I’ve looked at a window box and said, “Are those ivy leaves blue?” The sun is definitely not kind to the fake stuff. plastic flowers are kings and queens of the graveyards around where we live, every cemetary is abundant with vases and pots of them! They exist here, as well. Personally, I’d rather be remembered with something living, rather than with something that will outlast my remains. Gruesome, but true. Thanks for the comment. I completely agree with you on this topic. And yes, I often wonder why people with a garden don’t use it, not even to sit in it when the weather is nice !!! Absolutely. I think people can find great comfort in a garden — just sitting in it. Once upon a time, one of the gardens I care for hosted a meeting of the town’s biggest garden club. We had every brown leaf pinched, every edge of every bed spotless, all soil surfaces patted with compost. You get the drill. Next day, the well-dressed ladies in sensible shoes gathered in a circular knot around this unusual display. I was on-hand to interpret the garden, and was only too glad to come answer their question: Cheryl, what is THAT? I prefer controlled chaos to “untidy”. Thank you all for giving air to many of my pet peeves both aesthetic and aural. 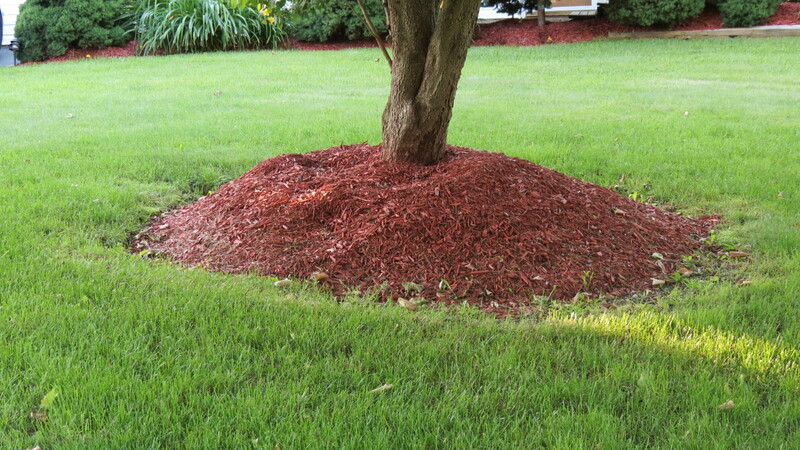 When I pulled up your blog and saw that picture, I thought ‘Oh, surely he didn’t do THAT in his yard!’ I was relieved as I read on…it never ceases to amaze me at the huge mulch volcanoes you see on commercial properties! Yikes! Love your blog, you always give me a giggle! Hi Kathy. Rest assured, my yard is volcano free. 🙂 Happy to give you a giggle. Hmmm. Around her we have plastic pink flamingoes dressing up the front yards. Tacky, tacky! They do pair well with the plastic mums though! Superb! Not the seedless thing but your commentary. Seedless grapes are a weird one for me, and I have to admit I just don’t compute non-gardening, and hate concrete even more – dreadful for the environment, miserable for the water table and sore eyes looking at it ! Keep on writing !! Excellent post! Attached a couple of links…other latitudes, other ways to look at gardening. Hello and welcome! Glad you enjoyed the post and I look forward to exploring your links. Be well. – Well honey, you remember the Grimlins? Their lawn has microscopic Mogwai, and if they water at night like you and I know you’re supposed to, the Mogwai will turn into Grimlins and devour their grass. Glad I could help — although I have been known to run a bucket brigade during very hot weather to de-stress some of the plants. I’m ok with bucket brigades! It’s the golf-course lawn that waters every day at 3pm when we’re on restrictions that blows my mind.